Defect free Sputum Cup Classic is offering by our company to our esteemed customers. 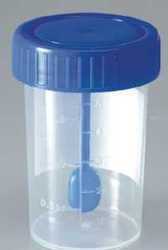 Our Sputum Cup Classic is highly effective to use and leakage free at the same time. On the other hand, this Sputum Cup Classic is developed with maintaining the world class standards in it. 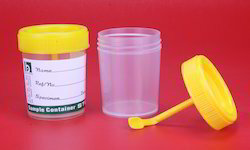 Made of Polypropylene, these Sample Containers are used for collecting samples of sputum or urine etc.These disposable containers are E.T.O. sterilized. Stool / Sputum containers 50x70mm. High safety closure caps. Molded graduation to 80ml with Interval 20ml. We are the leading manufacturer and supplier of a wide variety of Plastic SPUTUM Containers Sterilize. These containers are processed by our experts using excellent quality basic material and high tech technology. Further, these containers are strictly checked on various parameters to ensure flawlessness and defect free range.